Dhanavriddhi or Increase in Wealth and Money- Any ritual being performed for the generation of wealth and money using Tantric items like Hatha Jodi, Dakshinavarti Shankh, Ekakshi Nariyal, Datta Yantra or Shri Phal will become more effective if Kapoor is among one of the offerings. Havans- Havans will become more beneficial and fruitful if Kapoor is one of the ingredients. However, one thing should be kept in mind, the Havan should not be one, which is being performed for Tamsik or Destructive purposes. Buri Nazar or the Evil Gaze- Rotating Kapoor [Utara] over the body of a person believed to be at the reviving end of Buri Nazar is one of the most simple, common and popular method of exorcising Buri Nazar in India. 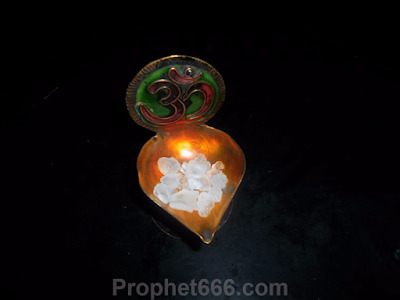 Soubhagya Vardhak or Increasing Fortune- If used is daily ritual like Aartis, Kapoor is effective in removing malefic, dull and regressive energies from the surroundings and increasing the potency of the rituals. Calling the Spirit of a Dead Person- The light emitting from one tablet of Kapoor and the smoke emitting from another tablet of Kapoor is used in ritual conducted for invoking spirits. However, Kapoor should not be used on a person who is on death bed but not dying because this is said to increase the suffering. To Remove Foul Odor- Apart from its occult and religious uses Kapoor is extremely in removing bad odor from the house. Sprinkling Powdered Kapoor is not only effective in removing the foul smell but also effective in destroying the parasites responsible for the same. Apart from the rituals mention above Kapoor is a very effective in increasing the power, potency and benefits of many Pure or Satvik religious and Tantric rituals.